So I started this whole baby outfit before we knew anything about the gender of Stormy. Over the Summer I made Little Giraffe and had quite a bit of this Cascade 220 Superwash leftover, so I dug into my pattern library to find something I liked to knit for his first outfit. 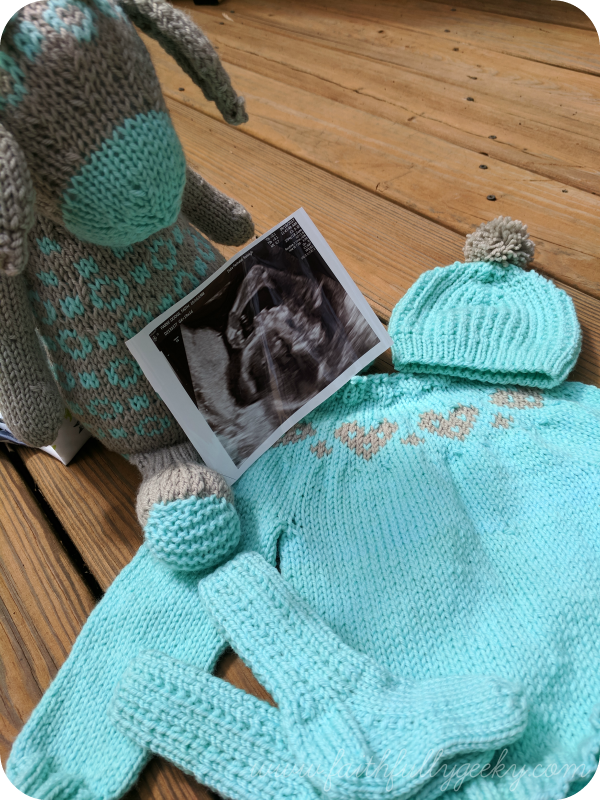 Yes, we are having a boy. We are very excited and it is just mere coincidence that I knit with blue. But really, are you surprised? This mint is such a great baby color. First up was a sweater. I knit the newborn size of the Spotlight sweater, but I wasn't feeling the colorwork. Since Stormy is a February baby, due mere days before Valentine's Day, I subbed in a heart panel from Heart On My Sleeve that had a matching stitch count. Now, of course, I feel like Pasha needs a matching sweater to do big brother/little brother photos, but I should probably finish his family photos cardigan first, right? Right. 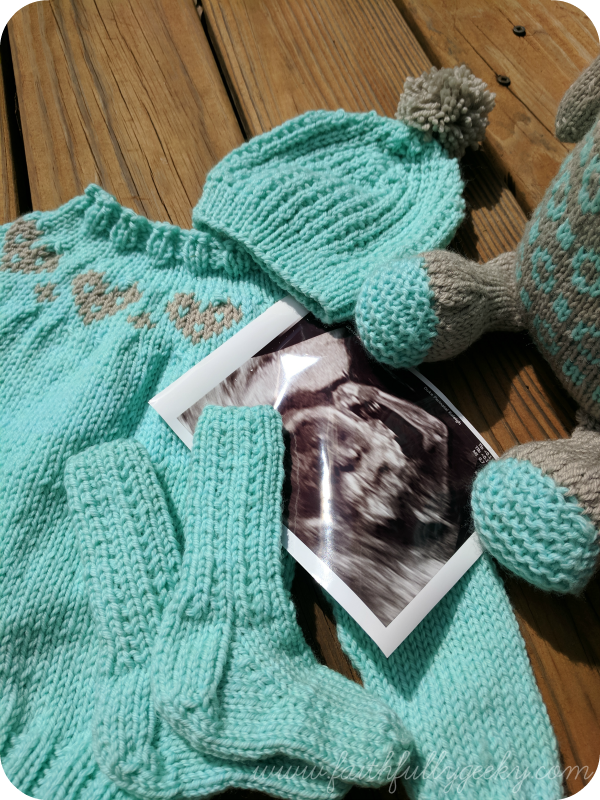 After that I still had almost a skein of the blue left (I started with one and a half when I finished the giraffe), so I decided to knit him a matching pair of socks and hat because after all, it will be winter when he is born. Keeping it a true Tin Can Knits outfit, I knit the Little Squirrel socks and Bumble hat from Max and Bodhi's Wardrobe (side note: a lot of people make comments about how hard it is to find patterns for little boys, but I find that with Tin Can Knits and Tot Toppers the selection might be smaller but it is also much higher in quality). After finishing the hat I might have run into the other room to show Chris and then promptly declared that everything in our house now needs a pompom. As you do. I have enough of the tan yarn left that I'm considering a second pair of socks or hat. All of these patterns are in newborn sizes, but seem to have come out a tad large. I'm not too worried though because when I had my last ultrasound the ultrasound tech commented on the length of his bones. Wait, I take that back -- I'm not worried about the fit of his clothes, but I might be a little worried about giving birth to him. Ah, the life of a boy mom.